Over two thousand years ago, as Mary waited upon the birth of her precious baby boy, the entire world awaited with her in unaware anticipation of the birth of their Savior. Each Christmas, I stop and try to imagine what must have gone through her mind as the impending birth approached… He was not only her son, but God’s Son in the literal sense, and even though He would have a difficult life, He would also bring her the gift of peace and hope. His life would bring her peace and hope. His birth brought to us the most precious, priceless gift. My personal gift to you this Christmas pales in comparison, but it is a gift from the heart; a gathering of my words. As your daughter, I want my gift to be a parallel of what Jesus brought His mother that first Christmas… peace, and hope. Just as I can not begin to comprehend how much Mary’s heart suffered in watching her precious boy grow up under persecution and evil, I can also not begin to comprehend how your heart suffered as you witnessed the destructive force of evil tear away at the fabric of your family. Mary is no more to blame for the sins of the world than you were to blame for the sins of your husband, my father. God knew Mary was a woman of honor, a woman of faith, a woman strong enough to trust with this most difficult situation… Mary was chosen by God for this, because He knew that in her difficult journey, she would bring honor and glory to Him. Out of every woman on earth at that time, He chose her. Imagine how difficult it would have been for us humans to choose someone for this task? God had no difficulty, He knew her heart. Do you realize that even over two thousands years ago... yes, even then, even in Mary’s time on earth, God already knew He would choose you as the mother in our family? He knew you were an honorable woman of faith, a woman strong enough to trust with this most difficult situation… a woman who would bring honor and glory to Him even though the challenges would be heartbreaking. Paul’s journey with Mary’s own Son inspired these words from Romans 5:3-5 “Not only so, but we also rejoice in our sufferings, because we know that suffering produces perseverance; perseverance, character; and character, hope. And hope does not disappoint us, because God has poured out his love into our hearts by the Holy Spirit, whom he has given us.” I can’t help but wonder if Mary ever had a chance to hear the words that Paul wrote, the words inspired by her Son. Those words have left a deep imprint on the hearts of Christians around the world almost 2000 years later. Those words have left a deep imprint on my heart. Just as Jesus did not look back upon His life and suffering and put any responsibility for this on His mother and just as Jesus was grateful for the way that Mary, His mother, raised Him honorably… I do not look back upon my life and suffering and put any responsibility for the suffering on you. This Christmas, and from this day forward… take this gift of peace and hope, and let it fill your heart to overflowing. Underneath the glorious wrappings of this gift, you will find a hidden, priceless, life-changing treasure beyond measure… healing. Suddenly, it was no longer the Maker's Dozen. Every few months, I would make a call to Compassion's headquarters and quietly inquire about Berling, the child from Nicaragua who captured my heart back in June. Time after time, I learned that the child whose photo I still had, unable to let her go until she found a sponsor, was still waiting for her answer to prayers. Those prayers were answered this week when I learned that a sponsor had finally chosen her among the sea of faces waiting their turn to be chosen. Strangely, I had been prepared to commit to her had I been told that she had not yet been chosen, but deep down, I knew she was not meant to be mine. I am not her sponsor. Still, as I rejoiced in the news that Berling had been sponsored, I felt that all too familiar stirring, this time with a twist. Reflecting upon the blessing of being supported by this community, as I have been so well loved and supported by the many friends God has brought to this blog... I thought of Kwagala, the child sponsored by Michelle's blogging community, and how beautiful it is to know that this young woman is surrounded by the love of an entire group of sponsors who love her and support her through her difficult situation. She had been chosen by many, and is loved by many. It became clear last night, quite suddenly, that God had chosen a child specifically for this blogging community too. Although I had many child sponsorship packs in hand, I knew the one God had chosen wasn't among those. I began searching, eventually going through hundreds of profiles before I knew beyond measure that I had found the one. Initially having no idea where this child would come from, thinking that perhaps God would have me sponsor a child from somewhere new to me, I was actually surprised to find that He had led me to a child from Ghana. I knew the moment I read her profile that she was the one, and then I looked at the country and grinned with disbelief. Really? Victoria is 14, and faces some special challenges. 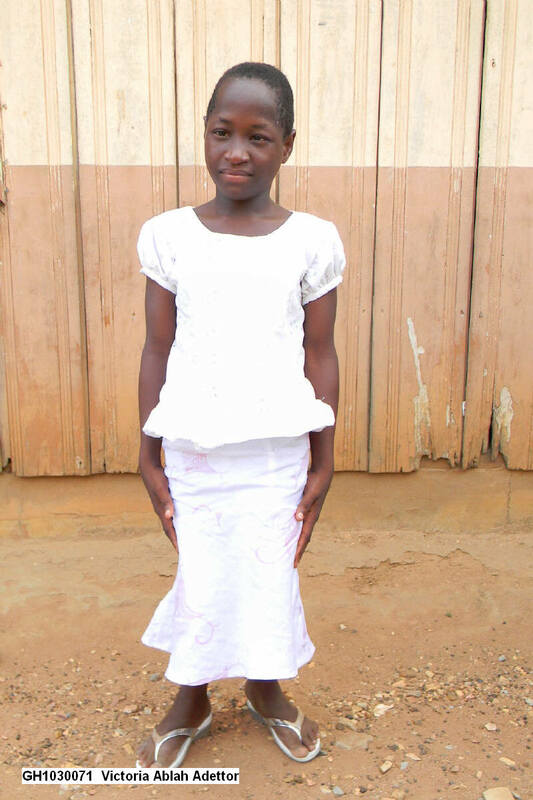 Crippled in both legs, visually impaired and in need of regular medical care, I knew that like Kwagala, this beautiful girl with such a peaceful, sweet face would benefit from knowing that she had a group of people lifting her up in prayer and support. She has five siblings and lives with both parents just north west of Accra, an area we're familiar with. Involvement in this sponsorship is voluntary -- you will know if God is leading you to step forward and take part in this gift of community. Whether you would like to commit to $1 a month or $5, or whatever the amount, however often, you will be able to take part in sharing in this blessing. How it works is well described by Michelle, I will simply point her way. If you have any questions/concerns, simply let me know. A one time donation can also be made. Contributions can be made through the Paypal button on the sidebar for Victoria's sponsorship. Thank YOU for the support you've given me through the years... may it flow into Victoria's life and lift her up as she soars to her full potential. Half a world away, and yet right here in our hearts, Richard still awaits freedom. It's now been 33 days since we met him face to face in Ghana, time still of the utmost essence for this young boy whose life is fast fading. His face and his plight has struck a chord in all of us, from the members of our team who met him face to face and desperately prayed through the negotiations, to the people we shared his story with. He has, for us all, become the face of child slavery, the constant reminder that the work is not over. He's not free, and he's not alone. I sat in church last Sunday, watching with the rest of our congregation the video testimony of God's provision for our mission in Ghana. Although the words from my interview were familiar to me, I had not seen the final video and was not prepared for the acute impact of seeing Richard's photo flashed on the large screens as I explained in the narrative that we had not secured his freedom. Sobs immediately shook me to the core. It wouldn't be the first time, nor would it be the last. As I attended the second service, I thought the impact would have been cushioned, having known what to expect and bracing myself for it. I am not alone, not in having been moved by Richard's face, that haunting look in his eyes and his desperate situation... nor am I alone in wanting to make a difference for him and the children still awaiting freedom. It would be all too easy to feel completely overwhelmed and helpless in the face of such a serious situation, but that's simply the enemy's way of distracting us from what we CAN do. The same was true in the vision of building the school -- those who struggled to see it as possible were perhaps simply focused on the seemingly impossible. It's understandable. Our first call to action has always been prayer, and it remains as such. I recently shared in an interview that while on the island, one could feel "absolute darkness mixed with absolute light". 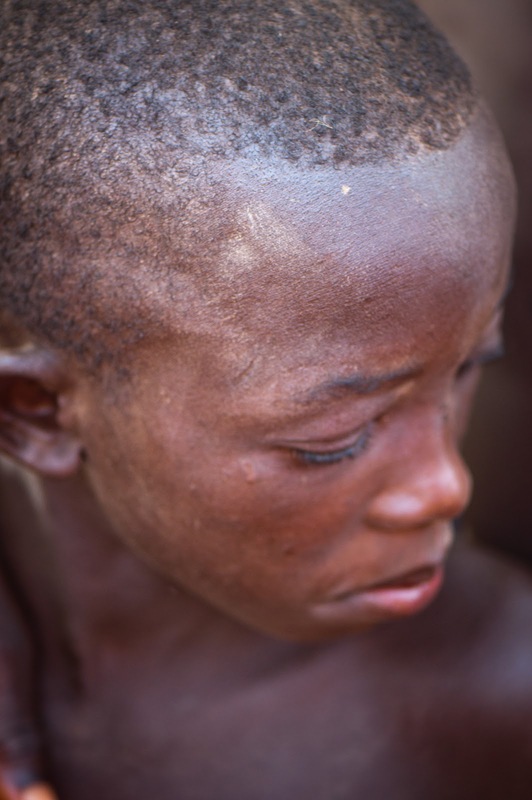 The primary battle when it comes to slavery is deeply spiritual, and to intercede with prayer on behalf of these children, even on behalf of the slave masters whose hearts need to be softened to the truth, is the most powerful weapon we can wield. Our second call to action is prevention. Compassion isn't merely a child sponsorship organization. Their holistic child development approach impacts lives far beyond that of the sponsored child, and it ensures that these children and their families will be empowered against the dangers of slavery. Our third course of action is to seed the fund that provides financial support and resources to those on the front-lines working toward the abolishment of slavery, negotiating and securing freedom, as well as supporting the rescued children through sponsorship until they reach adulthood. It's not enough to simply rescue these children. The need does not end there. Once rescued, Touch A Life Foundation, a non-profit organization based in Texas, commits to providing for the children residing at the Village Of Life in Kete Krachi, as well as a second refuge close to Accra. This includes but is not limited to food, shelter, clothing, education and medical care. Many of the children we met at the Village Of Life are not yet sponsored. Their needs are provided for through fundraising efforts and general donations made to Touch A Life. At $150/month, sponsorships are often done through "Find Your Mark" chapters/groups, based on the story of Touch A Life founder Pam Cope having been touched by the plight of one young child slave on Lake Volta named Mark, and providing for his rescue and care. Touch A Life foundation encourages everyone to also find their "Mark" and make an impact through sponsorship. We found our Mark. His name is Richard. 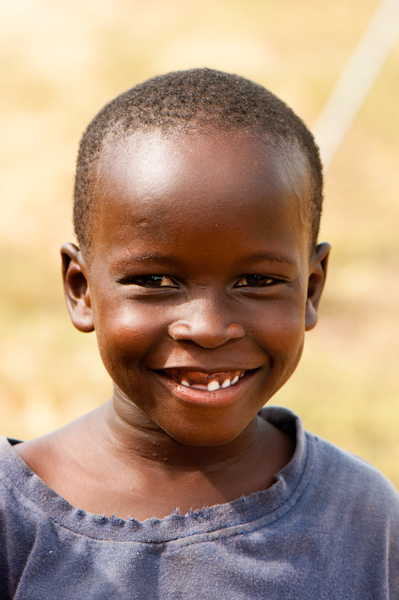 For those who are unable to commit to sponsorship, a general donation can still be made to Touch A Life for the care of children like our beloved Samson*, one of the most delightful children I have ever met in my entire life. Samson* was one of 116 children rescued in May as part of a large anti-slavery crackdown on Lake Volta. At five years of age, he is currently the youngest child at the Village Of Life. The joy of freedom shines so bright through him. This year, during the holidays, every donation made to Touch A Life until the end of December for the care of these children will be matched by a generous donor. This helps provide children like Innocence, Patrick, and all the others currently at the Village Of Life with all that they need to overcome their past and live their future to their full potential. Remember the classroom space? The Village Of Life was at maximum capacity and without more classroom space, it hampered their ability to release more children. The same holds true for the financial support given to Touch A Life. The more financial resources Touch A Life has to care for the rescued children, the more rescued children they will be able to support. We strongly encourage you to give to this amazing ministry before the end of December in order to make the most of the matching program, but we also encourage you to give to this organization at any time throughout the year. Last but not least, each and everyone of us can continue to share and spread awareness on modern-day-slavery. If I had a dollar for every person that told me they did not know that slavery still existed today, let's just say a very large donation could have been made to Touch A Life foundation. Information leads to transformation. As for Richard, although we're somewhat limited to prayer and financial support, there is great news: A sponsor has stepped forward for Richard, committing to sponsoring him in full should his freedom be granted. This is nothing short of an amazing answer to prayer, and such a beautiful, priceless gift. I spoke to a member of PACODEP's team a few days ago, and was told that they are preparing to return shortly to the island where Richard is in order to continue the negotiations for his release. Let's show the enemy that we are not giving up. The harvest belongs only to Him. Home is where the 'hard' is. With each "You're back!! How was Africa? ", my heart aches, permanently bruised by the experience, and yet longing to lean into that bruise, leaving no room for numbness. Who among them would understand that it was harder to come back than to be there? Who would understand that while some of us missed home, I struggled to miss it at all. Coming back nearing Christmas has made what was already difficult even more so. The contrast is what's hard. Going from extreme poverty that lays heavy on the world like an ashen blanket, to the excess of north american Christmas, skewed and stretched away from it's Holy meaning and origin all under the guise of "giving" being good. What is considered good in spending 450 billion dollars annually on Christmas in America when a mere 20 billion, just four percent, could provide clean water to everyone in the world, including the more than 20 thousand children who die each day from lack of access to clean water? If poverty covers the developing world like an ashen blanket, with beauty rising from underneath it all... does spiritual poverty hides throughout the developed nations like thin air, a stealthy cover deceiving us all into thinking all is well? Shaun Groves had warned us all -- coming back home from the geographical mission field is where the culture shock begins, when society would want to push you back into the middle ground, the balance, but where our heart cries out in protest, knowing instead that Christ calls on us to not live of the world, but live radically instead. I wanted it long before I felt the rust tinted and parched soil of Ghana under my feet, my experiences there not quenching, but further creating a deeper thirsting for radical. Posts like this simultaneously manage to strike a chord and hit a nerve, not because it convicts the already convicted even further, but because as much as I want what He wants, it doesn't take away the bittersweet of seeing what He has given someone else. A husband who loves and lives like Christ. Children who lead in matters of faith. A child not born of them. A full time mission in Africa. I consider myself a citizen of heaven, away from Home, longing and living to be there. As such, it was hard for me to understand why going to Ghana felt like I was coming 'home' without ever having been there, and why coming back 'home' from Ghana was much harder than coming back from Honduras last year. If Home for me is heaven, leaving me perpetually homesick, what is this new feeling of home on earth? It was as I was leaving for Ghana that it all begin to make sense, but I couldn't yet put it into words. This morning, I sat down to write, the original topic being clean water, and with each sentence, He was re-writing my words to lead to this. I know better than to force the words back to my own. His pen is so much stronger than mine. I want nothing more than to live completely in the freedom of a radical lifestyle, a life that would seem upside down in this broken world, but would be right side up for His Kingdom. To follow in His footsteps through the human example of Katie. To sell belongings and aim for a promotion at work, not because I want or need more money or some empty title, but because it would enable more children and families to be released from poverty or slavery, in His name. To live against the grain of North American living. To leave it all behind, yes, even family, pack nothing (or maybe just my camera and my words) and move to a developing nation to be His hands and feet there, living among the world's poor spiritually wealthiest, learning, growing, giving of Him, unable to sleep each night from the sheer joy of being there, where I most feel comfortable in the uncomfortable. And yet, I've noticed more and more that it's not me holding me back from it all, but Him, and He isn't holding me back as much as He is pushing me forward. I want to leave it all for Him and sometimes His answer is no, teaching me that living radically is relative, personal, subjective and individual, and that He guides my steps, slowly, carefully. He's also showing me that right now, the radical for me is in the allowing Him to place me where He wants, and not where the world would expect or understand. Who determines the balance, us, or Christ? Eschewing the world more and more so that human voices and influence dim and fade, turning away when the world's voices only add confusion or division, I seek to know what the Word speaks to me, where He leads me in the daily walk of life, trusting in the intimate ways He knows my heart and dances with me in the delicate minefield of my life. He has shown me that to many, I am already living radically in ways the world can not understand by intentionally choosing to remain in a difficult marriage to an unbeliever whose increasingly convicted heart makes him restless, reckless and cold from discomfort... an unbeliever for whom I pray for God's daily bread of love each morning as I awake and each night as I lay down. It's a spiritual battle that leaves me exhausted and in need of mercy and grace daily, with a generous helping of fruit. Being committed to him because of my commitment to Him is radical even though it shouldn't be, but if we simply only loved those who are easy to love, how radical would that be? What would set us apart from the rest of the world? Sometimes, living against the grain is simply parenting radically by choosing not to aim to raise happy children, but focusing instead on leading children to find joy in being responsible, well adjusted, giving and selfless. Teaching them by example that there is treasure in doing the difficult. Sometimes radical simply means letting go of the church tithing that would offend and enrage your spouse and make him less trusting of church and religion (if possible), and accepting instead that for us, tithing looks different than the traditional giving to the local body of Christ. God softened my husband's heart to child sponsorship, so rather than tithing to church, this is what God has given us as way to live in the balance. My tithe to church becomes instead serving weekly with my time and gifts. It's letting go of the desire to give Christmas away completely, and accepting that He helps me find the balance between having gifts under the tree and choosing instead to give it all up in order to offer gifts of hope elsewhere in the world. It's coming to terms with the grief of having come to my limits of living simply. It's giving grace and mercy radically. It's being radically patient and loving, yet knowing when to walk away. It's not comparing ourselves to others, and others to ourselves, when God shaped us each with the work of His hands, no two alike, and when we don't see the heart, only He does. I don't have it all figured out, I don't always live it well. Sometimes, I fail miserably, but in that failure and brokenness, He continues to grow and shape me. God alone guides my balance at home between living my faith in ways that bring him to Christ, and living a faith that is also relational rather than divisional. I don't always get it right, in the eyes of the world or in the eyes of God. Yet, even when I get it right in the eyes of God, the world doesn't understand or see what He sees, doesn't know the heart, convicts -- God, Judge & Jury of the human form. Not only has here become the uncomfortable and the hard daily living, but I've also learned that the mission field isn't simply something that only changes the others whose presence God leads us to enter and remain in, but instead, it is where He places us in the hard corners of the world, where He shapes us by saying "stay here, in the uncomfortable, and learn... learn to seek only Me, through the people I have provided to you." Where I am a full time missionary for His kingdom, painfully learning to bridge the gap between where He needs me to be, and where I want to be. Our youngest could be described as a mix of eccentric, quirky, hilarious, colorful and intense... with an uncanny resemblance to Cindy Lauper. My mom keeps it simple and calls her delightful. She's on the autism spectrum, and although she has overcome so much and is doing better each year, there are still so many ways that this impacts her life as well as ours. I wouldn't change a thing. She truly is a delightful ten year old with her own unique Christmas tradition. Years ago, when she was struggling with so many areas of language and auditory processing issues, asking her what she wanted for Christmas was an event in and of itself. Unable to process the question and communicate her answer, more often than not she'd simply answer with whatever was on her mind (or in her vision field) at that moment. I remember that first time she was able to answer this question, she was probably 4 or 5, and she was certain that she wanted carrot sticks and underwear. Most children that age would probably have asked for Barbie this, or Dora that... but not this kid. Her sensory issues made her request even more peculiar -- she couldn't tolerate wearing underwear. It was simply what was on her mind at the time, it's not what she really wanted. 2008 -- Romaine lettuce hearts. 2010 -- Cheese. The orange kind in the shape of a wheel, but just a small slice. 2011 -- Cheese. Mozarella. Or maybe marbled. She's such a sweet girl, doesn't ask for much, and appreciates what she is given. I tried to think of something I could give her aside from the usual (food & books) even though that will always be her favorite, and that's when I noticed that for the last few months, she has been using a pair of headphones that are held together with electrical tape. They're the kind that cover the whole ear and she prefers those as it helps her focus, but the sound isn't great at all. Still, she doesn't complain. The way she figures, if no one likes them, no one will take them! She has siblings, can you tell? That same day, I saw colorful pairs on sale at my favorite online retailer, and at half the price, I figured it would make a very useful gift for this musically talented young lady. I picked a pair of yellow ones, her favorite color, and had them shipped to my work address so that she wouldn't open the package as soon as she gets home from school. It's so hard to surprise her, since she has an extremely keen sense of observation and intuition, I was excited to have her Christmas shopping figured out. That's when he dropped the bombshell. "Uhm, I'm on speakerphone... and Jillian's right here beside me." She had been so quiet, and with my hearing issues, I hadn't realized that I was on speakerphone or that she'd been there all along. She sheepishly pipes up... "I sowwy!" I had to laugh. And laugh... and laugh some more. Chances are, she'll forget by Christmas, and it will be a surprise all over again. Such is the life on the spectrum -- full color spectrum, as I like to call it. Never a dull moment. Exactly 24 hours and 30 minutes after posting this and asking you all to share via every social media outlet available to you, a representative from United contacted me directly with a sincere apology and a good, productive conversation about what took place so that steps could be taken to find sustainable solutions for these issues. I shared that my intentions in writing this post weren't to be "out to get them", but simply to help them realize the potential losses they could face if these issues weren't addressed. Since our attempts to resolve this at through the proper channels created more problems, we simply had to resort to more effective means of getting their attention in order to solve the issue and help them take advantage of the opportunity to improve their business. They expressed a genuine appreciation for that, and not only immediately issued the refund to Tia's credit card, but they will also be calling me back tomorrow to continue working with us to see what can be done to ensure that these problems don't repeat themselves. Last but not least, they read about our purpose for our travel to Ghana, commended us on our humanitarian work, and expressed their sincere regret on inadvertently making it so difficult for us to focus on the purpose of our mission. We will see how the discussions continue tomorrow... I will keep you posted. I can not thank you enough for your tremendous support -- my heart goes out to all of you who have emailed, commented and contacted me through various methods to share your horror stories. I hope you also were able to obtain results, and I hope that this is truly the beginning of the end in this nightmare, and that all this will soon be rectified in full. I’ll be honest, I don’t have a business degree, and for what it’s worth, I’m not a rocket scientist either. In fact, I don’t consider myself to be of great intelligence, but I pray that I make up for that with common sense and wisdom. That’s more than I can say for United Airlines in light of our recent experience with them. We were simply trying to do good -- traveling to Ghana to work on a child slavery rescue mission, where we successfully negotiated the rescue of two children from slavery and begun building the school we had raised funds for... so to thank us for our humanitarian efforts, United charged me twice for my flight and won't negotiate the release of the funds they owe me. The experience left me wondering why it is that I seem to have more business sense than one of the largest airlines in the world. Sometimes, I need to have things broken down to me in small, manageable chunks of information, so perhaps that approach will work for them as well. Let’s give it a try. A company’s bottom line goal is to earn a profit. Given that we have all heard of the financial crisis facing airlines, it’s peculiar to me that United’s approach to earning a profit is to choose to save money by encouraging their customers to use their website to purchase services, but then refuse to accept payment from a large percentage of those potential customers, simply based on geography. They can not accept a Canadian credit card on their website. Strange, considering that the U.S. vendors I’ve shopped with in the past (from family owned businesses such as Lisa Leonard Designs, Goat Milk Stuff and Wild Olive Tees, up to large corporations such as Walmart) have never discriminated against me for being Canadian. My Mastercard number works just fine on their system. In fact, they welcome me giving them business. Imagine! United’s approach forced me, the customer, to have someone else make the payment on my behalf. For convenience’s sake, I chose to comply to their wish, and had my best friend and travel partner purchase the ticket on her American credit card. The charge was never questioned by her credit card company, even though it was a large sum and for an airline ticket not in her name. Unlike United, her credit card company seems to trust her and value her business. The charge appeared on her credit card statement, and she paid it with the money I had forwarded to her. The assumption that inconveniencing a customer is great for business seems to be counter-intuitive and counter-productive, when so many other companies would gladly welcome having people give them thousands of dollars… but while this business model is inconvenient and unconventional at best, it could have been worse in the end. That is, if the nightmare that had just begun had an end in sight. A company should not assume their customers are criminals. Unless, of course, they’re running a privately owned for-profit prison or something, by all means… but last I heard, prisons don’t fly. And neither does United’s accusation that the purchase of my ticket was fraudulent. The credit card company never questioned or flagged the transaction. United Airlines’ computer system, however, decided that since the name on the ticket and the cardholder name did not match, it was automatically fraud. Ironic, since it was their system that refused to let me use my credit card for my own ticket. I guess it didn't occur to them that if I had really stolen her credit card, I wouldn't have booked the seat next to the cardholder for a 12 hour flight to Ghana. #awkwardmuch? Since United seems to subscribe to the theory that two wrongs make a right, they corrected the problem by not calling us to alert us that there was an issue, and just to go the extra mile and aim for three wrongs to make a right, they didn’t contact the credit card company either, lest they find out they had made a critical error. By this point, I am beginning to ask myself if they handle safety quite as competently. A company advises their customers when they revoke a transaction. If United is brazen enough to assume that we’re criminals, and they are bold enough to revoke my ticket… one would think they would have the courage to admit what they had done… you know, in case I might be interested in knowing that the airline ticket for travel I’ve been planning all year has been revoked. All the better if they do this before I drive 6 hours to the airport and arrive ready for my flight. Imagine the horror of the experience for my 13 year old son, who had visions of travelling to a developing country without his mother at his side. United sends me notification after notification that flight times have been adjusted by one or two minutes, why not let me know that my ticket has been cancelled altogether? Again, I’m no rocket scientist, I just figure that since they have my email and information for the purpose of keeping me updated as promised, they’d actually use it to send me vital information. A company’s mistake shouldn’t penalize the customers. You know that Business Degree I don’t have? Yeah. I do have some education from the School Of Life, though, and I seem to recall the following topic being covered in Common Sense 101: When a mistake is made, the best apology is a sincere one that involves taking ownership and rectifying the situation as to not cause undue hardship and further inconvenience for your customer over a mistake your company has made. “Mishandle the funds that have been paid to you, refuse to take ownership and rectify the situation, and force me to pay you $1400 again, with only the comfort of the standard “oh yeah, cheque’s in the mail” promise that a refund request was initiated a month earlier and would soon be sorted out. A company should not persist in making their customer’s experience miserable. Mechanical failure happens. Twice in one day, even, as our 4th travelling partner, Debra, also experienced mechanical failure in her connector flight with United. What shouldn’t happen is for United to then proceed to book us into overbooked hotels, leaving us waiting more than an hour outside in the cold in the middle of the night for shuttles to those overbooked hotels, and giving us meal vouchers that the hotels will not honor… only to wait 40 minutes in the hotel lobby for someone to say there is no room at the inn. Makes me grateful Mary and Joseph went by donkey and not by United. It was far better to ride around on a donkey for days while 9 months pregnant and in labor... without an epidural. Hi Ho, Hi Ho, Back to The Airport We Go!!! When we return to the airport the following day in order to spend two hours repeating the entire process all over again, do not continue to impress us with your incompetence by not drawing the two straight lines with a pen, as required by security on our boarding passes. I know you may have thought we enjoyed dragging all their carryon luggage back to the ticketing counter only to have to start the whole process again, but the only reason we did so was that we, once again, were being forced to accommodate for your mistakes. Over, and over, and over again. It is within a company’s best interest to not steal from their customers. A company’s reputation is important to attract business. When you tell me that a request for the refund you owe me has been initiated on October 3rd, and that we can expect a refund, don’t expect us to not be upset when you then proceed to tell us, once you’ve forced me to overpay you, that a refund won’t be forthcoming because you never received my money to begin with -- even though you did receive it, and you have proof. Of course you received my money, the credit card charge in the company’s name appeared on the credit card statement, and it was paid in full. How else did you ever issue the ticket you later chose to revoke months later? Don’t continue to insist that you’re keeping the money you’re not entitled to, that you don’t know what happened to it, that you can’t issue a refund, and that this is not your problem. Don’t tell us to call at a specific time when a supervisor is available, only to then advise us that we can not speak to a supervisor. Don’t tell us to go to our credit card company when they did not cause any of this and you hold the power to correct it. Don’t send us a “please accept our apology” certificate for the inconvenience of the flight delay that falsely claims that you take pride in being a reliable part of our travel plans, and that you regret the inconvenience we have experienced. Don’t ask us on an online survey to assist you with making our experience with United better, when you have no intentions of responding to our concerns. Don’t kill me with humor by offering me a $200 voucher for United or a 20% discount, as though I would EVER willingly choose to fly with United again. If I can raise $30,000 to build a school for rescued child slaves in Ghana, surely I can raise enough to pay the extra to fly on another airline. A company understands that without customers, it can not survive. Do you understand, United, do you? Do you honestly think anyone who hears about this ridiculous treatment by United will choose to trust your company or fly United? How exactly do you plan to survive when you’ve managed to turn all your customers away? If you object to how United handled this situation, or you've had similar experiences with United that you'd like to share, please let your voice be heard! Since dozens of attempts to rectify this through United directly did nothing to get these issues resolved, we would like to have a turn at seeing how quickly they'll respond once this post is made public, and preferably viral. Please share liberally on Facebook, Twitter (@United, @CompassionCan), via Email, billboard, and any method you can think of. If anyone would like to purchase some space in their in-flight magazine to share this story, by all means, be my guest. I'll even pitch in a few bucks to defray the cost. P.S. For your convenience, since I like to make life easy for MY blog readers -- I have created a TinyUrl for you to share this blog post with ease. I'm nice like that... :o) You're welcome. P.P.S. United, I'll say hi to Dave Carroll for you... another fine and talented Canadian. Back in September, walking past a bulletin board at work, I saw the word Africa on a one page printout, and I stopped to read what it had to say. To this day, it still amazes me that God made that one word jump out at me, but He knew He needed to. The poster was an announcement for a sponsorship opportunity. Each year, thousands of our employees from across the country are eligible to apply for this sponsorship, and if they are the one person chosen for that year, they are given a sponsorship for a 2 week mission trip to Africa to build wells, schools, or other vital infrastructure projects. I saw the notice on September 9th, and noted that the deadline to apply was Sept 15th. The application simply instructed anyone interested to write an essay as to why you would like to take part in this opportunity. The best part was knowing that regardless of the outcome, there would be no one losing. If I was chosen, I would be blessed with the opportunity to return to Africa and contribute to a community in need. If someone else was chosen, they would be blessed with the opportunity to go to Africa, perhaps for the first time, and contribute to a community in need. What an incredible gift all around! I asked my husband's blessing to apply, and having received it, sat down and wrote my essay. I thought it would be hard to limit it to 700 words, as instructed, but it was strangely easy to do. I sent it off, and given the focus on our work in Ghana, it became the furthest thing from my mind. A week before we left to go to Ghana, I received an email in my inbox at work, informing me that I had been chosen to receive the sponsorship for 2012. You may wonder why it took me so long to share here... well, honestly, there are two reasons. Our focus was Ghana and our work there, but beyond that, well, I was just struck speechless, really. Returning to Africa, in less than 3 months...?! Oh how He loves! Destination? Cameroon... just a few countries down the coast from Ghana. Cameroon is officially English and French, much like the province in which I live, so my bilingualism may be an asset. It is said to be Africa in miniature, whereas it has a little bit of all of Africa compacted into one region. The work will be very physically challenging, much more labor intensive than Ghana was... so beginning this week, I will be hitting the gym on a rigorous fitness program to prepare for what will be required. We will be traveling there in what will be the hottest months of the year in Cameroon, so I anticipate it being very uncomfortable. I just cut 8 inches off my hair, and I may cut it down even more before then. Less hair, less heat! Less weight, less heat too, so pray I can succeed in losing 20-30 pounds. Much like my time in Honduras, I gained 15-20 pounds within days of landing in Ghana, which makes tolerating the heat difficult, but with heavy labor, it will be even more so. All the travel costs are covered and the project is fully funded. I already have all the immunizations, the passport, and the malaria meds. Although I will have to cover the unpaid time off work (I used the last of my vacation time for Ghana), I'm not concerned, I know God will provide in His own ways. I'm really excited about this opportunity, and grateful beyond measure that God would provide for this. One of the reasons I'm grateful that I will not have to focus on raising travel funds for this, is because it allows me to focus on fundraising for two other opportunities. One being what God would have us do in Ghana in 2012 (to be announced as soon as God gives me the green light! ), the other being my sister-friend Michelle's Compassion travels to Ghana. Remember Precious' sponsor? That's the one! When we're blessed, it's not for our benefit, but so that from the abundance of blessings, we can bless someone in return. That is what I would love to see... this blessing I've received, used to bless my friend Michelle. To contribute to Michelle's Compassion Ghana fund, please visit her blog and bless her today -- no amount too small, God will multiply it all! In his book "Too Small To Ignore", Wess Stafford shared that every encounter with a child is a divine appointment, an opportunity to plant a seed for God's kingdom. I prayed over those seeds as I prepared to teach a class of 8-9 year old girls at our church this morning. It's not only their hearts that need those prayers, but mine, so that it can be prepared to sow those seeds and to learn from these children just the same. Every month has a theme in our children's ministry, and this month, in light of Christmas, our theme is Generosity -- "Making Someone's Day... By Giving Something Away." As part of our lessons, we saw a video about the parables of the rich fool. The children got to see how the man had hoarded riches rather than sharing his abundance with others who had less. His greed had so moved God that God Himself came to speak to him, calling him a rich fool, and letting him know that on that very night, he would pass away, and then what of his riches that he had hoarded for himself? As we walked back to our small group classroom, I asked the girls what their impressions were of what we had just seen. She had been pensive as she pondered what she had just seen. The question that arose from her put the prayers of this morning to the test. "So, if we're not generous, do we die too? ", she asked. There is only one lifeline available at times like these, and thankfully the Holy Spirit never gives us a busy signal. He provided the answer in real time. "Jesus provides life to the fullest when we invite Him into our heart. He fills our heart, if we let him, and He fills it with life, eternal life... but when we choose greed, we choose to give a part of our heart to someone else than Jesus, we give that piece to the enemy, and that piece of our heart dies. So yes, there is a part of us that dies when we choose greed. Greed does rob us of life -- anything less than Jesus robs us of our life." We finished our time together with a game of Stick-It-To-Ya, where we chase each other with a handful of stickers, trying to stick them on everyone else because it's much more fun to give, you know? She who gives away all her stickers wins. I explained that we would call this the Tahameena Game, because Tahameena shares the stickers we send her with her brothers and friends who haven't received letters or stickers. Generosity, reinforced. It was hard to get the stickers to stay stuck to us, they kept falling off of us, but no matter... It was a beautiful way to wrap up our morning, with a reminder that there are things that are meant to stick to us temporarily, and then, there are lessons we pray stick to our hearts for a lifetime. Although I was equipped with a macro lens, they were so tiny and the lighting in our room so minimal that I knew I wouldn’t be able to capture the moment in a photograph. The tiniest ants I had ever seen, living in the largest anthills I had ever seen! Dozens, perhaps hundreds, crawling from the window of our room at the guest house, down the wall, and onto my laptop which I had set down on the floor. Fascinated, I watched as the ants crawled under the maze of keys on my keyboard, emerging carrying traces of crumbs to carry back to their colony. Although dirt and dust covered us day in and day out in Ghana, my keyboard has never been so clean. Isn't it just like God to provide sustenance for life, out of our crumbs, our extras... life, out of the bits and pieces that when we really stop and think about it, we can do without? Isn't it just like Him to include us into His provisions so that we can learn from Him? When dawn breaks gently from the east, it will have been twenty full days since we met face to face on a desolate island of Lake Volta, where you are enslaved. Dawn is still hours away, it is nearly 4am and sleep can’t reach me. My bones are aching, my soul is weary, and yet when I close my eyes, all I see is you, halfway across the world, paddling a boat as the dawn breaks, bones aching, soul weary, and I ask myself, how does rest reach you, and what do your eyes see? 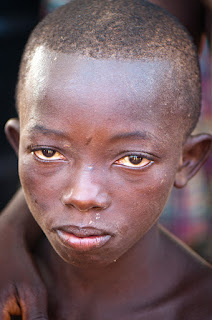 Surrounded by a group of boys your age, the quietest of the group, you silently spoke volumes about the brutal effects of slavery on a boy of such tender years. Our attempts to bring a smile to the boys’ faces and convey that we were not a threat was met by curious smiles, laughs and relief by all except you. It was as though you weren’t there, your spirit long ago having checked out in the face of such perpetual darkness. Did their laughter feel painful to you as you continued to feel invisible? Did your surroundings cause you to further attempt to disappear into another dimension where nothing could reach you, not pain, joy, or the concept of hope? I knew all too well that in that situation, feeling nothing was an involuntary defence mechanism... numbness prolonged survival. It was in those moments that I realized that we weren’t seeing you, Richard, we were only seeing the shell of the boy whose heart, mind, body and spirit could no longer bear the weight of slavery. How much longer before the sins of this world crushed you, as they crushed our precious Savior on the cross? How much longer would you have to endure the darkness man had pulled you under? From your seat on that wooden bench, what did you hear? How many times had someone come and attempted to set you free, only to leave empty handed? How many times had someone come, expressing concern over you, perhaps causing you to grasp on to hope by the little strength you had left, only to lose that grip as the negotiations were thwarted once again by the enemy? Did hope even flicker this time around, or was it too painful to contemplate that hope was even possible? Peace only finds me when my mind takes me back to where you are, and this time, I do what I failed to do the first time we met... I take you in my arms, gently lift your face until your eyes see mine, and I do everything in my power to pour Christ’s love into your spirit. There are so many things I failed to share with you, precious boy... that you are loved and treasured far more than the heart can ever imagine, and that the Lord made you not by the word of His mouth as He made the entire world, but by the work of His hands... you are Handmade, special, unique, and His beloved, and not one of your tears has fallen outside of the Creator’s care and concern. Understanding all too well that these words would have stung and fallen empty on this side of freedom, I would have gently told you never to lose hope, that our only hope is in Christ and Christ alone, that God knew of your suffering and that He would watch over you until the day of your rescue... knowing in my heart that your first taste of freedom could very well be your first breath of heaven. Having known the desperation of abuse, we both would have understood all too well if this blessed mercy was all we had the strength left to pray for. Beyond the eternal Living Water that I would have shared with you, it pains me to know that I had little to offer your immediate physical needs... to have quenched your thirst and satisfied your hunger would have helped me teach you of the One who sustains us all. Such things wouldn't have needed translation; feeding His sheep needs no familiar words as it is done through the universal language of love. Richard, not having held you breaks my heart more than my mere words could ever express. As a mother of sons who have never outgrown the joy, safety and comfort of a gentle snuggle, a mother’s touch, I long to know that in this lifetime, you have known this kind of love at least once. Knowing that as a human, a mother and a Christ follower, I failed to share that love with you keeps me awake night, after night, after night. I can't help but wonder if you even know to dream of such things -- when was the last time you were held, Richard, and do you know a mother's love? Where is your mother as you continue to languish here on this island, and does it tear her up to be apart from her son like it tears me up to have had to leave you behind? While it's crushingly painful to see you and carry you with me everywhere I go, I pray that pain never lessens, never heals, never becomes numb by the world’s endless pressure to fit subtly in the deceptive trap of the middle ground. I simply and ever-so-complexly can not choose to return to the life I once knew. No, I beg the pain to remain, the pain that serves to remind me that Jesus calls on us to live radically, to eschew the world’s dangerous blindness and to open our eyes to what breaks His heart. You are now mine, Richard, not having grown in my body, but having been indelibly engraved upon my heart... you, chosen for me, and I, for you. You have become, to me and to many, the personal, heartbreaking face of slavery. Even though my words may never reach you on this side of the veil, your voice has been heard, Richard, your voice has been heard around the world, and it will not be extinguished until every man, woman and child you represent has been set free. May God deal with me ever so severely if I should fail you again.